Welcome aboard your Air Baltic flights from Brussels to Riga and back again! Today I take a look at the meals that Air Baltic are offering their Business Class customers travelling across Europe. The airline is based in Riga, Latvia and offers one of the coolest inflight meal ordering systems for Economy Class passengers, while those in Business Class will be sampling the latest in Latvian and European cuisine. Menus are hand-delivered to all passengers in Business Class and before the main meal you can select a drink of your choice from the wide selection available. Juices, Soft Drinks, Coffee, Tea, Sparkling Wine, Champagne! (Heidsieck Monopole Brut), Red or White Wines, Beers, Whisky, Cognacs, Vodka, Gin, Liqueurs, Riga Black Balsam and Vermouth! Before your main meal is served, the cabin crew will deliver you a special “Chefs Special Entrée” which is a small welcome from the airline and their famed Chefs Thomas Muenzel and Andris Vasilonoks. Nice touch. Everything, the meals presented well and tasted great. But if I had to choose a favourite meal, it would have to be the first dish I sampled from Brussels to Riga. The cabin crew were attentive on both flights and were also flexible (at my request) about when I wanted to eat inflight. Our friends at Air Baltic flew us to Riga as a guest of the airline. 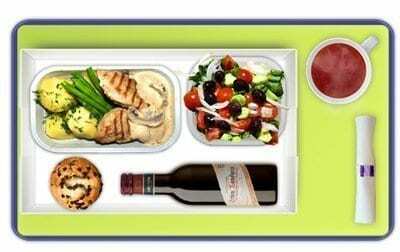 Pick and Choose Your AirBaltic Inflight Meals!